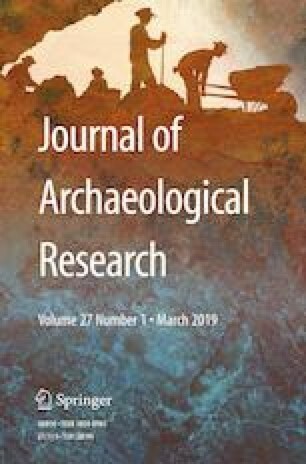 This paper discusses the degree of social complexity in southeastern Europe in the fifth millennium BC and presents previously unreported evidence from the tell societies of the Lower Danube. Based on the analysis of stone, flint, and copper axes of various types from Pietrele in southern Romania, I argue that social distinction, as deduced from the Varna cemetery, also can be identified in contemporary neighboring regions with poorer burial rituals. In these societies, some members distinguished themselves by their access and accumulation of prestigious items, with a special emphasis on axes, adzes, and shaft-hole axes. This socioeconomic constellation was ideal for the adoption of metallurgy, which was considerably developed for the production of prestigious axe heads. These, in turn, stimulated innovation in other crafts and materials. Distribution patterns, source-critical consideration, and new excavation results indicate that the social order visible in the cemetery of Varna was not limited to the western Black Sea coast but was shared by neighboring communities, where the social reality was masked in seemingly egalitarian funeral rites. Through this discussion, I also bring in recent evidence for early metallurgy in southwestern Asia. This text is in large parts the result of my participation in the Pietrele Project of the Eurasia Department of the German Archaeological Institute. I thank Svend Hansen for his help and unparalleled commitment to my work. I also thank Gary Feinman and Linda Nicholas for their welcoming assistance and kind invitation to write this paper as well as the six anonymous and one open peer reviewer, whose insights, comments, and criticism have helped to sharpen the focus of the paper. Any errors remain my own. Garfinkel, Y., Klimscha, F., Rosenberg, D., and Shalev, S. (2014). The beginning of metallurgy in the southern Levant: A copper awl from a late 6th millennium CalBC Tel Tsaf, Israel. PLoS One March 26, 2014 [ https://doi.org/10.1371/journal.pone.0092591]. Kegler-Graiewski, N. (2007). Beile–Äxte–Mahlsteine: Zur Rohmaterialversorgung im Jung- und Spätneolithikum Nordhessens, Ph.D. dissertation, Institut für Ur- und Frühgeschichte, Universität zu Köln, Cologne, https://doi.org/10.11588/ai.2008.1&2.11078.